We are publicising the completion of the facade of the South Tower, dedicated to offices and residences. Today, both towers are operating, making it the most significant ventilated facade ever constructed with solid surface, which thanks to the Wilson Associates studio, has been created with PORCELANOSAKRION. 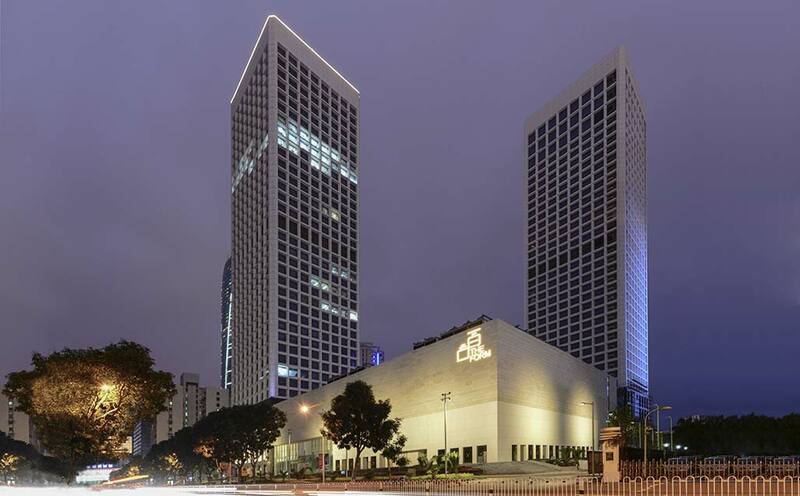 This project is dizzying, with two symmetrical towers 160 metres tall, 47,000m2 of facade created with KRION, 24,000 pieces made in Spain and assembled in Haikou (China), and around 3 years of construction to reach this architectural milestone. The journey was not easy. We remember the most extreme test the work was exposed to, the Super Typhoon Rammasum, the largest typhoon in the last 40 years in this part of Asia, which the material withstood outstandingly. Perhaps the strength that differentiates this project is the logistics necessary for transporting pieces manufactured in Toledo by the company CompoSolid, delivering them to Haikou, with customs and duties. This was arduous work carried out thanks to the KRION team, collaborating companies, and the effort of hundreds of individuals who helped us to carry out this project at the pinnacle of infrastructures created with Solid Surface. We would like to take this opportunity to thank all individuals who have participated in the project for their work, dedication and enthusiasm.